With over 100 million records sold, Scorpions are one of the first rock bands to blast through the barriers and play all over the world, especially in the Far East, Eastern Europe and Russia. They initially struggled to reach a wider audience in their home country of Germany, despite huge success in many other parts of the world. THIS is what makes this concert film Live In Munich 2012 – a homecoming event at the Olympiahalle in Munich on December 17, 2012– so emotional and meaningful. Scorpions rock like no other, and this live DVD shows just how. Live In Munich 2012 is a high octane performance, captured before a wildly enthusiastic crowd, and serves as further proof of the power and electricity theScorpions bring to the stage! Showcased in this concert event, the band deliver fiery renditions of their classic anthems: “Wind Of Change”, “Rock You Like A Hurricane”, “Send Me An Angel”, “Still Loving You”, “The Zoo”, “Big City Nights”, “Is There Anybody There?”, “No One Like You”, “Sting In The Tail”, and many more -- all captured in High Definition. 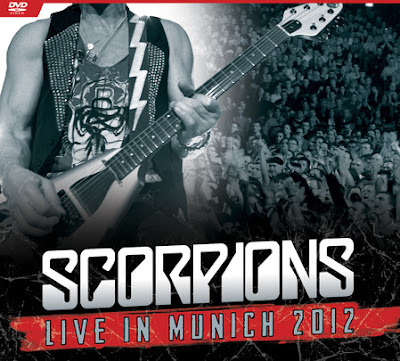 Live In Munich 2012 is a fascinating look at one of rock music’s most engaging, potent and successful acts, which makes this an essential purchase for any Scorpions fan!